Green schools is an international environmental education, management and awards programme, which promotes and acknowledges long-term whole school action. It is a programme which introduces students and the wider community to the concept of environmental friendly practices. Our school is a Green School which promotes and encourages all forms of recycling and energy saving. Littering the College building or grounds is unacceptable. It does not respect the fine environment of the College and it is disrespectful to others. 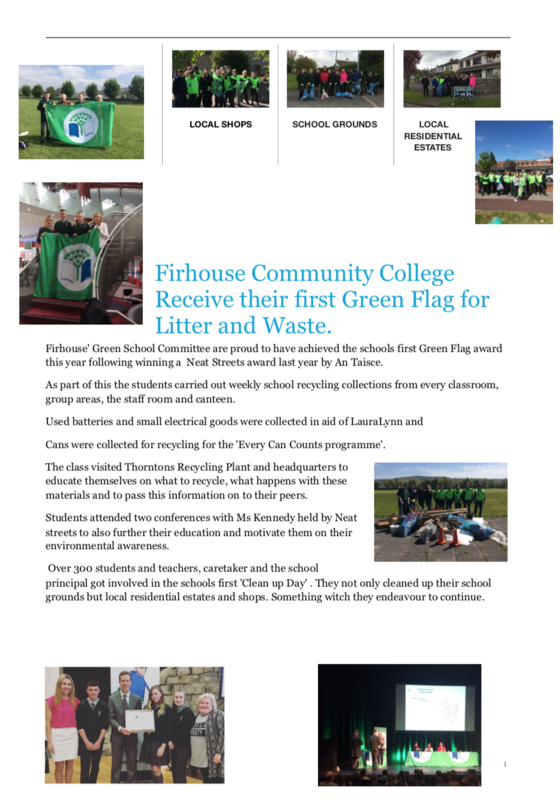 Having received its first green flag in 2018, the school is now working on applying to the South Dublin County Council for more much needed bins in their locality to prevent littering and continue to increase environmental awareness in their school community.